A while ago, I saw this pin and knew this was something I had to make! I am working on a gallery wall for our master bedroom and this is going to go perfectly. This was super easy to make - and literally cost me only the frame, so about $10 from Hobby Lobby. I could have used a frame I already had but I wanted a rustic looking one. For the pennies, it didn't take as long as I thought it would to find the years I needed, but I did spend some time looking for pennies of different shades. I just wrote up everything else on word and printed on white cardstock. I used super glue to attach the pennies to the paper. Like I said, super easy. This was something I put together in less than an hour on a Friday night. I can't wait to hang it up with everything else! This is so cute, Lizzie!! What a great idea! I can't wait to see your gallery wall!! Aaaahhhh this is so cute. I have a print with dates in my room but I love the addition of pennies to yours. 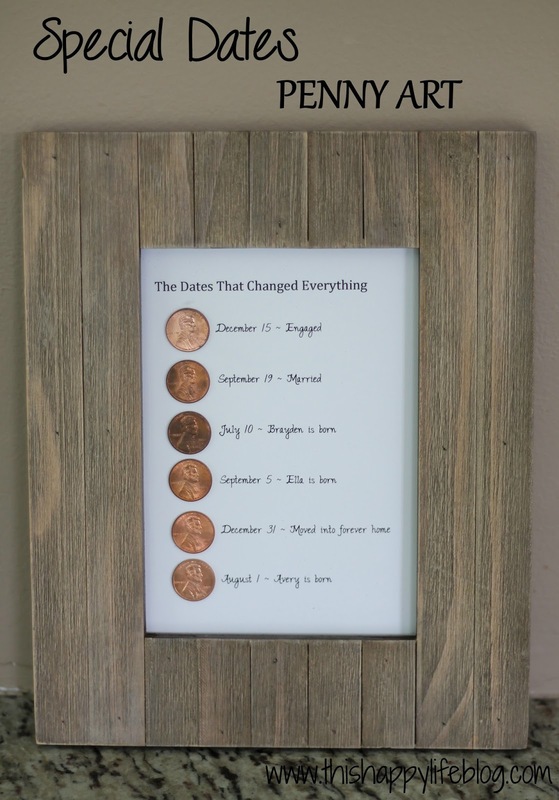 This is such a cute idea; it turned out fabulous!! I love this!! I am going to totally steal this and make it for a friend. I love love love love this! Sorry... I'm just really excited because I've been struggling with finding her a gift and you just made my life so easy. Oh my heavens this is perfect! Thanks for sharing! AAAAHHHH you did it!! it looks so good and I LOVE that frame!! I really must do this! It would be perfect to sit in a frame on our entertainment center! Such a neat, memorable piece! Love how it turned out. This is such a neat idea! I love how meaningful it is and that it is so dang cheap!